The Chinese vessel Zhen Hua 24 departed Fremantle Port at sunset on Tuesday evening, heading for Brisbane to deliver one of the massive 50metre-high container cranes there, as she had also done in Fremantle. The cranes are for DP World operation around Australia and four of them were still onboard when the ship left, which made for a very impressive sight, and is one of the many reasons why I love the working Freo port. The battle for the operation of the container terminals on North Quay at Fremantle Ports is getting serious with the Ports soon to announce the shortlisted operators. Present stevedores Patrick’s and DP World are having serious competition from Australian and overseas companies who have moved into port operations in the Eastern States. Part of the contract will be the development of North Quay, so the port will be there for a long time to come. The new contracts will be for a period of 25 years from 2017, so anyone dreaming about the port leaving Fremantle any time soon and the area free for residential and commercial development will be disappointed. I am not, as I believe the working port is an integral and exciting part of Fremantle. 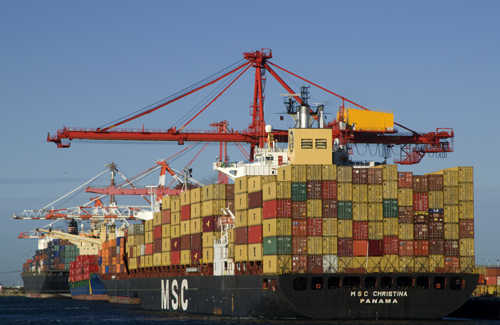 703,327 containers were moved at Freo port in 2013-2014 so it is a lucrative business for those who win the tender.